The Ford Edge could be a candidate for the Vignale trimline. 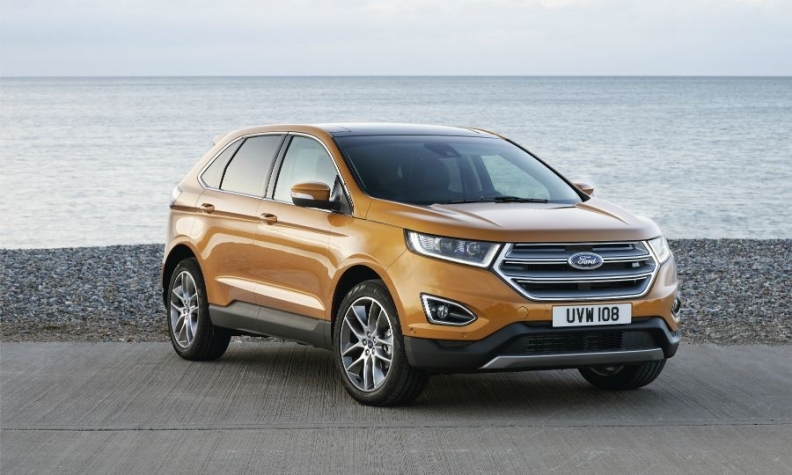 Ford of Europe isn't saying which models will next get its upscale Vignale trimline but the brand's two largest SUVs are the top candidates. Ford said in a Feb. 3 announcement that it will expand its Vignale variants to at least five by 2017 as part of its plans to improve profitably at its European operations. Currently Ford sells the Mondeo midsize model with a Vignale trim and will soon add a Vignale version of the S-Max minivan. A Ford of Europe spokesman wouldn't comment on future Vignales except to say that the Galaxy large minivan will not get the trimline. Adding Vignale versions of the Edge large SUV, which will go on sale in Europe in the second quarter, and the recently face-lifted Kuga compact SUV, would make sense because these models earn higher margins than regular cars such as the Focus hatchback. Ford will unveil two of its new Vignales at the Geneva auto show in March when the automaker will give over its entire stand to the upscale line on the show’s the first press day. Vignale models are finished in luxury materials and sold in dedicated "Vignale Lounge" areas in selected showrooms across Europe. Ford has said it wants Vignale models to account for around 10 percent of its European sales. The automaker is targeting business drivers whose firms allow them to choose their company car, Ford of Europe's head of sales and marketing the region, Roelant de Waard, told Automotive News Europe last year. He estimated these 'user chooser' buyers could account for 80 percent to 90 percent of Vignale sales. Ford and its mass-market rivals are promoting upscale lines to prevent customers switching to premium brands. Renault sells high-trim models with the Initiale Paris badge while PSA/Peugeot-Citroen has made its upmarket DS unit into a standalone brand. Last year Mercedes, Audi and BMW had a combined 17 percent share of new-car sales in the UK, Ford’s biggest European market, up from 12 percent in 2006. In the same period Ford saw its share drop to 13 percent from 15 percent. Ford predicts that its expanded SUV lineup in Europe's fastest-growing segment will close some of that gap. It expects European sales of the Edge, Kuga, and its third SUV, the EcoSport subcompact, to rise by 30 percent to more than 200,000 this year. Ford currently lags a long way behind SUV market leader Nissan, which sold 231,220 units of its Qashqai compact SUV in Europe last year. Ford was the second bestselling in Europe last year after VW, with volume up in the EU and EFTA markets up by 8.6 percent to 1.02 million units, according to figures from industry association ACEA but Renault and Opel/Vauxhall are seeking to win the No. 2 spot (none care likely to catch VW brand, which sold 1.73 million cars in Europe in 2015). Farley is bullish that Ford will maintain its position. "We are creating a more exciting and distinctive Ford lineup in Europe," he said. "When we play to our strengths, we can compete and win in Europe, even against premium brands."